Sergeant Damien Hogan, meanwhile, said his suspicions were raised when newspaper articles closely matched private incident reports. A GARDA SERGEANT who worked in the Garda Press Office has told the Disclosures Tribunal he became concerned that the office was compromised and that sensitive information was being leaked to journalists. Sergeant Damien Hogan, who worked in the press office from 1994 to 2004, and again from 2009 to the present day, said his suspicions were raised when he saw newspaper articles that closely matched incident reports he had seen which had not been made public. “On many occasions I was quite surprised at the content of the article that appeared in the paper,” Hogan told the tribunal. The sergeant said press office staff had access to a lot of confidential information about criminal investigations. 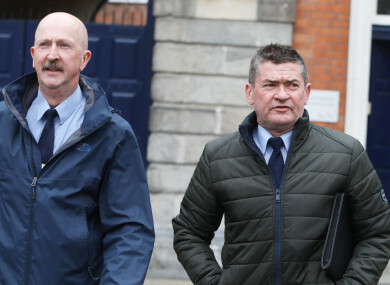 The tribunal is examining the allegation by former press officer Superintendent David Taylor that he was directed by former Garda Commissioner Martin Callinan to brief the media negatively about whistleblower Sergeant Maurice McCabe. Callinan denies this. Hogan said Taylor did not have a good relationship with Andrew McLindon, the civilian Director of Communications. “It wasn’t a very friendly relationship at all. I could see that from day one,” he said. “From day one it was very estranged. It just wasn’t working, there was no communication between them,” Hogan continued. Michael McDowell SC said that journalist Paul Williams had told the tribunal that Taylor gave confirmation that there had been a garda investigation into an allegation of sexual abuse against McCabe in 2006. The Director of Public Prosecutions (DPP) subsequently directed no prosecution in the case, saying there was no evidence of any crime being committed. Hogan said it “would be highly unusual” for the press office to confirm to a journalist that a person had been the subject of a historic garda investigation. “We would never, well I certainly would never, do that. From my experience in 20 years, we would never do that,” Hogan told McDowell. The tribunal heard that Taylor was a “stickler” for timekeeping, and had installed swipe cards in the press office, including in the toilets. Hogan said there was an “uncomfortable” atmosphere between Taylor and his deputy, Inspector John Ferris. The men shared an office with each other. Taylor had Ferris’ desk moved out of the office one weekend, Hogan said. “Every other press officer had worked with an inspector in the office, the inspector is in effect a deputy press officer. This wasn’t happening in this case,” Hogan said. He said he became concerned that the press office was compromised when he received a call from a journalist some months after Taylor had been transferred to the traffic division. A journalist who had queries about a Child Rescue Ireland (CRI) alert told Hogan, “I’m getting enough at the moment from Superintendent Taylor”, he recalled. As a result, Hogan rang McLindon and the new press officer, Superintendent Paul Moran. “It wasn’t his new role, it wasn’t his role to be briefing the media,” Hogan said. At the close of this morning’s session, tribunal chairman Mr Justice Peter Charleton said that “unpleasant things” were being said about Taylor which were not being challenged, and asked if Taylor should be present in case he needed to give instructions to his lawyers. Barrister Tara Burns SC said the legal team was in contact with Taylor and he was being kept informed of the evidence. Deirdre Mooney, a civilian clerical officer attached to the press office, told the tribunal that Taylor was “a fine boss”, while Sergeant Alan Frawley said he got on “very well” with Taylor. Sergeant James Molloy, who currently works in the garda press office, told the Tribunal that he would hear people discussing McCabe in the press office, though he could not recall who said what. He said that Taylor was uncomplimentary about McCabe. “Put it this way. I was clear if there was a side to be taken which side David Taylor was on, and it wasn’t on McCabe’s side,” Molloy said. Molloy said that Taylor “would be uncomplimentary of Maurice McCabe” and “uncomplimentary of any journalist who was writing about Maurice McCabe, any member of the Oireachtas who took his side”. Molloy said he was “vaguely aware” of a rumour of a sexual assault investigation, and that McCabe felt this should not be on the Pulse system. He could not say when he became aware of this case. The DPP had recommended no prosecution as there was no evidence of a crime following the 2006 investigation. Asked by tribunal barrister Patrick Marrinan SC if Taylor was uncomplimentary towards McCabe because of the assault allegations or because he was speaking out on garda issues, Molloy said it was because McCabe was speaking out. Molloy said he was not aware of a smear campaign against McCabe, and was never told to smear anybody. Marrinan said that Molloy was the only one of thirteen staff members in the garda press office, heard so far, who said that he had heard about McCabe during his work. Molloy said that Taylor had “a tendency to gossip and chitchat in the office after an incident”. “I thought it was dangerous to be saying that in the press office, because that would bleed into the media,” Molloy said. People shouldn’t be reading about injuries to victims, the gruesome nature of crimes, in the media, or at least, we shouldn’t be providing it. The sergeant said that Taylor did a lot of media briefings and “pieces to camera” during his time as press officer. “There is always the danger in the press office of loving it, getting a buzz from it. I thought he had fallen into that trap,” Molloy said. Superintendent Pat Ryan, the head of the Garda IT section, told the tribunal that he had been asked in 2017 to identify all computer hardware used by former commissioner Nóirín O’Sullivan from 1 July 2012 to 31 May 2014. Ryan said that garda computers were upgraded from Windows XP to Windows 7 at the end of 2014, and as part of this process, a file share system was set up, and data was held on the file share system. Emails sent on garda accounts were archived, and even if an email was deleted from a local computer, it would not be deleted in the archive. Log-in details from computers were still available in audit logs, the tribunal was told. Ryan said that five laptop computers had been assigned to O’Sullivan between 2006 and 2010, and these could no longer be recovered. A hard drive from an office desktop computer had been located. No laptop was assigned to O’Sullivan during her time as Commissioner. Two iPads used by the commissioner had been located, although one had a fault. Four out of six laptops used by Callinan could not be located, and one machine had been rebuilt and redeployed. Callinan purchased the laptop he was using at the time of his retirement, which was reset to factory settings to remove garda data before he took it home. Email “Former garda press office boss 'got a buzz' from doing job, colleague tells Tribunal”. Feedback on “Former garda press office boss 'got a buzz' from doing job, colleague tells Tribunal”.